I started out my trip with a passage from Cannery Row, and now I'd like to share another Steinbeck excerpt, this one from East of Eden. Samuel sat in the buggy beside Lee, and his clobber-footed saddle horse shuffled clumsily behind. "What's your name?" Samuel asked pleasantly. "Lee. Got more name. Lee papa family name. Call Lee." "I've read quite a lot about China. You born in China?" Samuel was silent for quite a long time while the buggy lurched down the wheel track toward the dusty valley. "Lee," he said at last, "I mean no disrespect, but I've never been able to figure why you people still talk pidgin when an illiterate baboon [like myself] from the black bogs of Ireland, with a head full of Gaelic and a tongue like a potato, learns to talk a poor grade of English in ten years." Lee grinned. "Me talkee Chinese talk," he said. "Well, I guess you have your reasons. And it's not my affair. I hope you'll forgive me if I don't believe it, Lee." Lee looked at him and the brown eyes under their rounded upper lids seemed to open and deepen until they weren't foreign any more, but man's eyes, warm with understanding. Lee chuckled. "It's more than a convenience," he said. "It's even more than self-protection. Mostly we have to use it to be understood at all." Samuel showed no sign of having observed any change. "I can understand the first two," he said thoughtfully, "but the third escapes me." Lee said, "I know it's hard to believe, but it has happened so often to me and to my friends that we take it for granted. If I should go up to a lady or a gentleman, for instance, and speak as I am doing now, I wouldn't be understood." "Pidgin they expect, and pidgin they'll listen to. But English from me they don't listen to, and so they don't understand it." "Can that be possible? How do I understand you?" "That's why I'm talking to you. You are one of the rare people who can separate your observation from your preconception. You see what is, where most people see what they expect." A realization I've had in the year since I completed my walk is that much of what I learned ties back into the message of the passage above: the importance of seeing things for what they are, and not what you expect them to be. Now, that sounds kind of obvious, doesn't it? Don't we all see things as they are? Isn't that what seeing is? I don't know about you, but I really can't imagine an English-speaker actually not understanding English just because it's coming from the mouth of someone unexpected. Surely our perception of the world is more reliable than that. But our preconceptions and prejudices do have a lot of power in shaping the way we see things, albeit typically in much more subtle ways than that blatant example from East of Eden. And our expectations of what we will see can be especially dangerous because we generally don't realize that those expectations exist, and so we're unaware of how they're affecting our perception. We just think the world that we see and experience is the world that is out there, which sounds straightforward enough. How could it be any other way? When I was preparing for my walk, I found that many of my friends and family, and even people I had just met, were very concerned about my safety. I would be out on the road for months with little protection against people who might want to hurt me or rob me, not to mention the danger I could face from wild animals, bad drivers, and severe weather. Some people thought it was utterly foolish to even attempt such a journey, while others tried to convince me that I should at least carry a gun to defend myself against all the crazies I would surely meet out there. And it's not hard to understand why these people were so worried. Just flip on the television or open a newspaper, and you're hit with a barrage of stories about all the awful things people do to each other every day. The picture of the world painted by the news is quite grim. And it's not just the news, either. After all, the media is ratings-driven: they're just presenting the stories that attract an audience. There's something deep in human nature that is drawn to those negative stories, maybe something rooted in our ancient survival instincts: a drive to keep track of the dangers around us so we can better avoid them. A lot of people have entire mental catalogs of stories about the bad things that have happened to people they know, and they use those stories to make decisions about what is and isn't safe to do. And, honestly, this seems like a reasonable approach. Collect whatever information you can about what happens to various people in various situations, and then you can make informed decisions about similar situations in your life. How could such a simple, logical process lead you astray? Well, I'm here to tell you that it can, and that it does on a regular basis. Despite all the seemingly well-founded concerns for my safety, I'm happy to report that I was not murdered on my walk. In fact, not only was I not murdered, I also wasn't hurt, stolen from, or threatened even once in the five months I spent out on the road1. And it goes well beyond a simple lack of negative interactions with strangers. I was also quite dependent on the kindness of strangers on my walk. Each night, when the sun was getting low in the sky, I would go up to the nearest house, knock on the door, and ask if I could camp in that person's yard. I was completely reliant on someone I had never met before taking a chance on me and letting me sleep in their yard for the night, and, of course, not killing me while I slept. I figured that I would have to ask around several times each night, but that I would eventually find somewhere to stay. Well, it turns out that three-quarters of the people I asked let me stay with them, and the majority of them invited me in for dinner, or let me take a shower or do my laundry, or even let me stay in their guest room for the night. Some people would cook me breakfast the next morning and pack me a lunch to take on the road. People would check in on me after I left to make sure I was doing okay. One woman even cried when we were saying goodbye. I got to join in on family barbecues, family bonfires, family movie nights, and family hot tub time. People took me on tours of their towns, made their favorite foods for me, fed me from their gardens, and performed music for me. They'd often apologize to me for their house being messy. Can you believe that? They took me, a total vagrant, in off the streets on a moment's notice, completely unplanned; they fed me dinner, were far nicer to me than they had any reason to be, and yet they still felt the need to apologize for having not tidied things up before I got there. Now that's some pretty incredible hospitality, and yet no one seems to know that it really exists out there. Obviously I had some faith in people from the start, otherwise I wouldn't have done this walk in the first place, but even so, I was completely blown away by the generosity and kindness that I found day after day after day. And it wasn't just the people I approached for help. People would pull their cars over when they spotted me on the road to make sure I was all right, or to give me some food or water, or even money to help me on my way. Some of them thought I was homeless and in need of assistance; others were just curious, but then became really excited and supportive when I told them what I was doing. People would start rooting through their cars in search of something useful they could give me, so great was their desire to help me in some way. The contrast between the America that we see on the news and the America that I saw in person was unbelievable. I was, and still am, completely shocked by how blind we can be to the goodness that surrounds us. How is it possible to be so unaware of something so prevalent? Do people keep their inner kindness hidden from one another? Maybe we just never give ourselves a chance to see people's better sides in the first place. Maybe our expectations about how bad people can be are keeping us away from the very situations where we can experience their goodness. Whatever the explanation, I can only begin to wonder how much we miss out on every day, and how much we limit ourselves, because of unfounded fears based on unrepresentative stories that we hear on the news or from our friends, or even that we witness ourselves. When we let fear take control of our decision-making, we introduce a new and very real type of danger into our lives: the danger of not experiencing much of what the world has to offer us. Human existence is a pretty extraordinary thing, and it's all too easy to let the remarkable opportunities it provides pass us by and leave us in the dust. Now, I don't claim to be any better than anyone else at seeing the world in an objective way; it's just that I had no other choice when I was on my walk. Under normal circumstances, our preconceptions filter the very experiences and interactions that we have in the first place. For example, if someone I've just met makes a comment to me that I find offensive, I'm likely to try to get out of the conversation, walk away from the person, grumble something like "People like that are just what's wrong with the world today", and try to avoid future contact with them. I've seemingly made a judgment about that person based on some concrete piece of information about them, but I've also prevented myself from ever learning anything else about that person. Maybe they're offensive to me in that one way, but deeply kind and compassionate in other ways. It seems obvious to say that every one of us has a lot of good and bad traits all mixed together, and yet we regularly characterize people in a black-and-white way, as good or bad, depending on whatever little information we know about them. But the situations I was in on my walk forced me, over and over again, to realize how foolish it is to write people off so quickly when you learn something about them you don't like. I ended up staying with some people whose values differed greatly from mine in one way or another, people whom I might have written off as bad people under different circumstances, and yet I had to recognize that they were also people who would take in a total stranger and care for him. No matter what they were like in other regards, there was at least a part of them that was kind and generous and loving, and that's probably true of almost everyone in this world, even the people we really can't stand, whose beliefs and actions offend us to our very core. It's hard to keep that in mind, though, and it doesn't help that our first encounters with people are often in situations that accentuate their negative traits. I was thinking about this the other day on the subway, when a couple sitting right behind me was talking really loudly about the most inane things. They wouldn't shut up, and I kind of started to hate them, but then I realized that there were probably people just like them I met on my trip, but instead of sitting in front of them on the train, I was asking them if I could stay in their yard, and they were perfectly happy to oblige. Who knows what sort of people the loud talkers really were? To me, they just seemed inconsiderate of their fellow passengers, but had I encountered them in different circumstances perhaps I would have a totally different opinion of them. These experiences have made me realize how my preconceptions about people who hold certain beliefs or act in certain ways have been keeping me from seeing those people as they truly are, and from appreciating, and enjoying, many wonderful things about them. I've also realized how much I had been limiting myself in terms of the people I interacted with on a daily basis. You'd think that, having lived for several years in New York City, possibly the most diverse place on earth, I'd be well acquainted with all sorts of different perspectives, beliefs, and customs. Being exposed to people from such varied backgrounds and cultures should give me a better understanding of other types of people, right? I would have thought so, but what I realized on my walk is that being in New York had largely had the opposite effect on me. The flip side of there being so many different types of people in New York is that there are also so many people just like you. And those are the people you're naturally drawn toward. There are a lot of important relationships and connections you can only make with people who are deeply similar to you in one way or another. So, of course, it's fun and rewarding and healthy to spend time with people like yourself, people you can really understand. But the cost of spending your time solely with those people is that you miss out on interacting with people you don't understand so well — people whose beliefs and behaviors can conflict with and challenge your ideas of what is right. And those interactions aren't always so pleasant, but they can be richly rewarding and uniquely educational in their own right. More than once on my walk I found myself sitting around a dinner table with a family whose upbringing was completely foreign to me, and whose strongly held political beliefs clashed directly with mine, and that reminded me how much I don't know about this world, and how I'm never going to learn it if I limit myself to hanging out with people who are like me. And it's deceptively easy to develop baseless stereotypes about people you don't spend time with. I remember once being in Israel and listening to a rabbi speak about the barrier that Israel was then constructing, in response to some terrorist bombings, to separate itself from the Palestinian West Bank. Putting aside the legal and humanitarian objections to this plan that many people had, there was also a lot of debate at the time about whether or not the wall would even work in the first place — would it prove successful in keeping the Palestinians out of Israel? But the rabbi said the important question wasn't "What happens if the wall doesn't work?" but rather, "What happens if it does?" In other words, what happens when you eliminate personal contact between two neighboring groups of people? What happens is you lose contact with reality; you start to demonize the other group and you start attributing all sorts of terrible behaviors to them. You fall back on the handful of bad stories you can remember about them from the past, and you have no new interactions with them to challenge your beliefs. And causing two rival groups to demonize each other and believe the worst about each other is about the worst thing you can do for the cause of safety and security. There's no greater danger than the danger of not knowing your neighbors. At some point on my walk it struck me that most of the fears people had for me were about things they knew nothing about. People in rural areas thought I was going to get murdered in the inner city. People in cities thought some crazy rancher in Montana was going to shoot me for setting foot on his property. The people in the Rocky Mountains weren't the ones afraid of grizzly bears and mountain lions; it was the people back east who only knew about the attack stories they heard on TV. 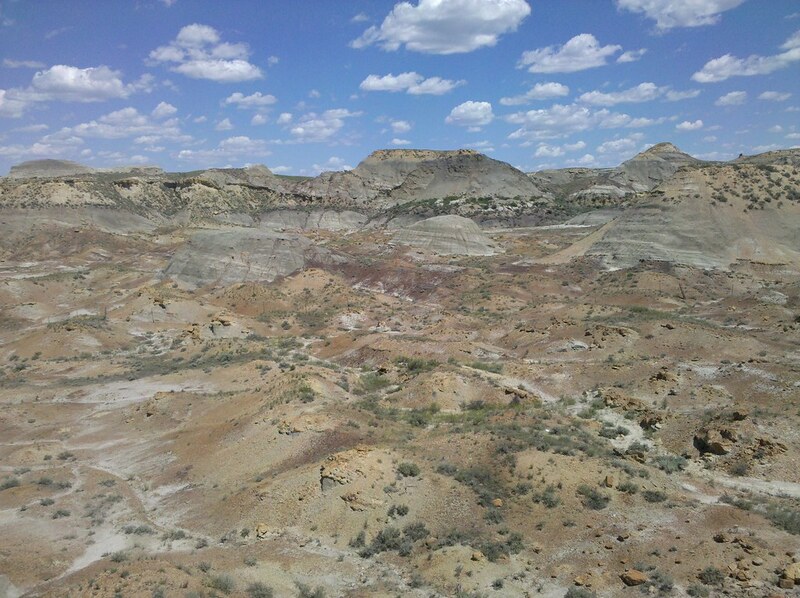 One guy in Wisconsin told me he wouldn't dare walk across Montana without a gun to shoot all the rattlesnakes. But, as I learned from people who live in Montana, rattlesnakes, like most animals, do their best to stay out of the way of humans and only attack if they feel threatened. And then I saw the parallel between these people's fears and that story about the Israeli wall. It's only when people are isolated from some potential danger that they really begin to fear it in a way that's totally out of proportion. When we let our expectations of danger make decisions for us, we end up avoiding the very experiences that have the power to change those expectations. In that way, our fear of the world is self-sustaining. We never give ourselves the chance to learn that our fears are baseless, because we isolate ourselves from the situations that can challenge our fears. Now, it doesn't take being on the other side of the country, or on the other side of a wall, from something to isolate yourself from it. Sometimes you really can make yourself blind to what's happening right in front of you. When I was in western Pennsylvania I met a guy by the name of Gary. We talked for a while, and he asked me what my route through Ohio would be. I told him I was going to go through, among other places, the city of Warren, and he stopped me dead in my tracks. "You can't walk through Warren, believe me", he said. "It's one of the most dangerous places in the entire country. I know; I've lived there all my life. I mean, you better be carrying a weapon if you're gonna try that." I said, "Well, I have some pepper spray. I should be all right." "No, man. Pepper spray ain't gonna work in Warren", he told me. And he was really starting to freak me out. In the years I've spent exploring New York City, I've walked through all of the supposedly dangerous neighborhoods, and I've never felt unsafe, but the conviction with which this guy spoke was really getting to me. Maybe Warren is somehow worse? But then I thought for a little, and I asked him, "So, has anything ever happened to you there?" "Well, no", he said. "So you've lived there your whole life and no one's ever tried to hurt you?" "Well, yeah, but that's 'cause I'm always packing heat. But I can tell they want to hurt me. Those people, they look at me like I just killed their sister." Okay, fair enough, I thought. Even if no one actually did anything to me, I too would feel unsafe if people were looking at me like that. But, wait, let's think about this from the other point of view. What if I lived in Warren and I'm hanging out on my porch, and this guy comes walking down the street glaring at me, looking like he has a gun in his jacket. Of course I would glare back! That doesn't make me a bad person, and it doesn't mean I want to hurt the guy; I'm just responding to the situation he's created. "The world is like a mirror; if you smile at it, it smiles at you." It sounds a little dopey at first, until you think about what it is that she's really saying. In every interaction with another person, your words and actions represent half of the outcome. Half of what the other person says and does is just them responding to you. If you go in scowling at someone, of course they're going to scowl back. That doesn't mean they came into the conversation with anything against you; they're just reflecting your attitude back at you. And conversely, if you smile and say a friendly word to someone, they're probably going to smile back. Again, that doesn't necessarily mean they like you, but it does mean you're probably going to have a pleasant exchange with them. We like to think we can judge people based solely on their behavior, but remember: half of their behavior is simply them responding to our behavior. We have so much control over our interactions with others, but it's easy to lose sight of this. And when we go into a situation with a negative attitude, we've already largely shaped the outcome of that situation to be negative. So I walked through Warren, and just kept my attitude positive. Some parts of town felt a little sketchy, but I just kept smiling and waving at people out in their yards. Some people smiled back; some didn't. But not for a second did I feel in danger. And that just blew me away: that someone could live somewhere his entire life and be so delusional about what's going on right in front of his eyes. Maybe that passage from East of Eden isn't so far-fetched after all. Anyway, as I headed through Gary, I saw parts of town that looked really bad, or at least they looked like the kind of places where bad things happen on TV. And in one of the most run-down parts of town, I passed a house where a bunch of people were sitting out on their porch. One woman called out to me, asking me what I was doing. I told her about my walk, and she invited me over to take a load off for a little while. It turns out her family was having a Mother's Day cookout, so I just hung out with them for a while, talking and drinking Miller High Life. And that was how I celebrated Mother's Day in 2010 — sipping the Champagne of Beers with some new friends in the middle of a neighborhood that most people would describe as the ghetto, and would try to get away from as quickly as possible. Now that story about Gary — I'm talking about the guy now, not the place — was something of an extreme case. It's easy to fault his prejudices, and it's easy to see how his behavior could be changed. But things aren't always that clear-cut. One night in Minnesota I was looking for a place to stay, when I spotted a house off the side of the road. As I walked up the driveway, a dog came running up to me. As usual, I stopped to play with the dog for a little while, to make sure he wouldn't try to bite me as I approached the house. After making friends with him, I walked up to the front door and knocked, but no one answered. Just as I was about to leave, I noticed two little kids staring at me from one of the windows. 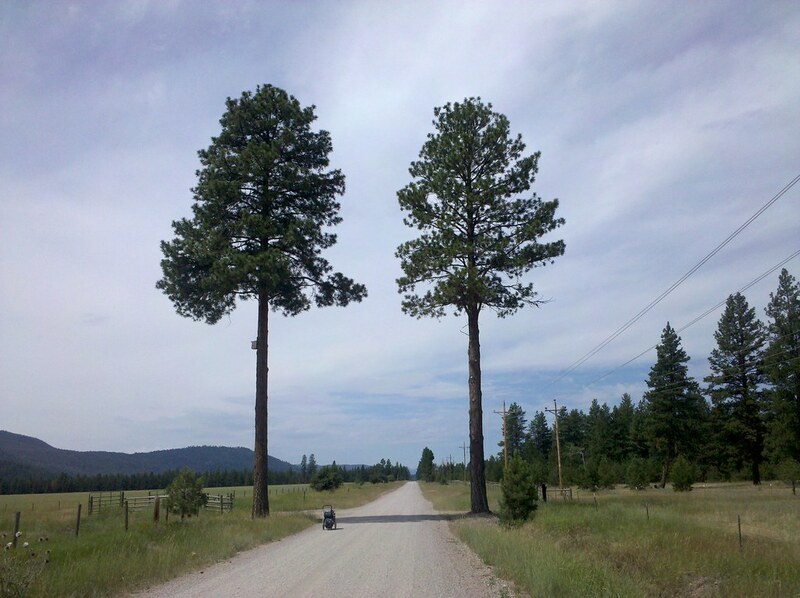 I asked them if their parents were home, but they said no, so I turned around and headed back out to the road. The dog followed me down the driveway and out onto the road. I was worried he would get hit by a car, so I kept trying to get him to go home. But nothing I tried worked, and he just kept following me. I walked another mile or so down the road, and came to another house. The couple who lived there, Duane and Sherri, took me in for the night, setting up a cot for me in the garage, making me dinner and milkshakes, and letting me take a shower. As I headed out to bed, the dog was still hanging around the yard. I woke up in the morning, ate breakfast with Duane and Sherri, and set off on my way again. The dog had finally left, presumably having gotten bored and returned home. And as far as I knew, that was the end of the story. But a couple of months after I finished my walk, I got an email from Sherri, telling me what had gone on back at that first house where I stopped. The children's mother came home shortly after I left, and the kids announced to her: "Mommy, mommy! There was a homeless man here! And he was looking in the windows! And he had a knife!" So the mother called the cops, as I imagine most mothers would do in that situation. The sheriff's office sent out a fleet of cars looking for me, but I was off the road by that point. When the father came home, they told him the story, too. They noticed that their dog was missing, and they decided that I must have killed and eaten it. The father got his shotgun and stayed up all night, just in case I tried to get in their house. In the morning, he thought that maybe I had slept in his tractor, so he quietly crept up on it with his gun to see if I was there. A couple of days later, Sherri went over to their house to go berry-picking. The mother came up to her and asked, "Did you hear about the homeless guy? The sheriff sent a bunch of cars out looking for him!" Sherri replied, "Oh, you must mean the young man we had in for dinner and milkshakes, and who stayed at our house for the evening." The mother looked shocked until Sherri explained who I was and what I was doing, at which point her surprise turned to embarrassment. Now that's a harder story to deal with. The kids had something of an overactive imagination, sure, but you can't really blame the parents for doing what they did. And yet, the result was a "reality" that was totally baseless in fact. If Sherri hadn't happened to run into the mother berry-picking, that false reality would have become fact, as far as that family was concerned. I'm sure those kids would never have been left home alone again. This could even have been one of those stories that become part of the neighborhood lore — the local example of how the world's just not a safe place anymore. Who knows how far-reaching the fear and distrust created by this one imaginary event could have been? And there's no obvious way to handle a situation like this any better — the parents didn't do anything unreasonable, and yet the end result of their actions seems totally unreasonable. It's really not an easy thing to see the world for what it is, after all. In fact, it's not even easy to see ourselves for what we are. A comment I've heard many times is: "It's great that so many people let you stay with them, but I don't think I would have been comfortable with some random stranger sleeping in my yard." For a while I was puzzled by the disparity between the relatively low number of people who think they would let a stranger stay with them, and the much higher number of people who actually did let me camp in their yard. And then I realized what was going on. There's a huge difference between the faceless hobo you cook up in your imagination and the real person who shows up asking you for help with a smile and a handshake. When people looked me in the eye and talked to me for a few minutes, they understood that I was genuinely doing what I said I was doing, and that I was not a threat to them. But I bet, before I arrived, many of those same people would not have thought they'd be comfortable having a stranger staying on their property. They didn't know how capable of kindness they were until I showed up and forced them to find out. 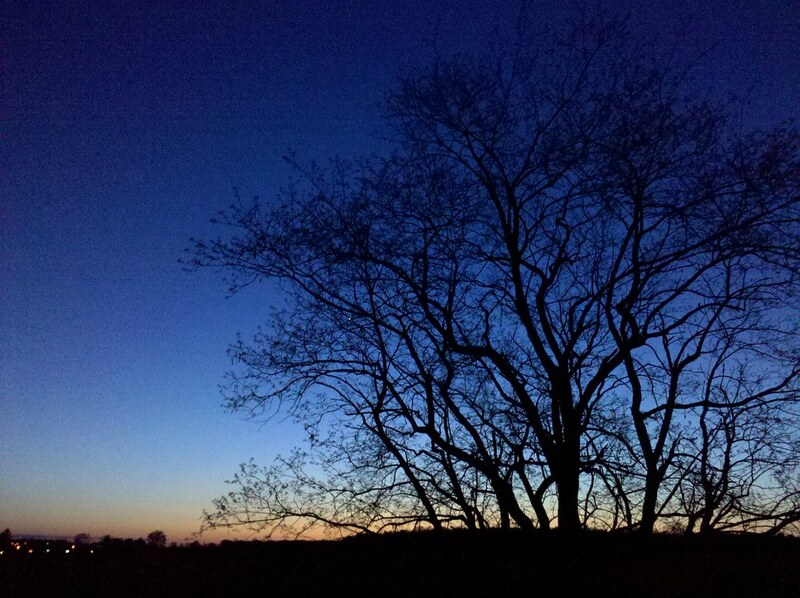 Early on in my trip, in eastern Pennsylvania, there was a night when I was having trouble finding a place to stay. All the houses in the town I was walking through seemed to have small yards, and at that point I was not yet comfortable asking someone if I could stay with them under those circumstances, because I figured they'd be uneasy having me set up my tent so close to their house. After all, no one wants a stranger staring in their bedroom window all night. Plus, what would the neighbors think? So I kept walking and walking, hoping I'd come to a house with a bigger yard or maybe a farm, but I never did. It was just one little yard after another. I eventually just had to pick a house and hope for the best. I knocked on a door, and the fellow who answered, John, was clearly uncomfortable with the idea of me staying in his yard. But he also, like many of the people who turned down my request, felt somehow responsible for me and tried to come up with some other places I could stay. As he was scrambling to think up somewhere better than the nearby church graveyard or the mowed area under the power transmission lines, his wife, Marie, stuck her head out to say she was going to fix up a plate of dinner for me. Before I knew it, the three of us were telling each other all about our families and our lives, and it wasn't long before John said, "What the hell am I talking about? Why don't you just come in and sleep on the couch tonight?" As it turned out, that was the night of the NCAA men's basketball championship game. John is a big basketball fan, but Marie had no interest in the game, so he ended up being really excited to have a buddy there to watch the game with. He whipped up some snacks and cracked open some beers, and we headed down to the big screen TV in the basement. Over the course of the game, John told me all about his dad and the health problems he was having, and in the process I saw how profoundly he loved and admired him. And that was one of the most touching experiences of my whole trip: watching someone put aside his expectations and suspicions and fear, and seeing the warmth and caring and friendship that grew to take their place. So how can we make that kind of experience more common? There's certainly no easy answer to that question. Maybe all you can do is try to constantly identify and challenge your preconceptions and prejudices, no matter how reasonable they may seem. Turn off the news, face your fears, fight through your expectations, and get out there and explore the world for yourself with open eyes and an open mind. My walk also revealed to me the importance of getting past our expectations in terms of travel and sightseeing. To explain this, let me first give you some background on how I selected my route. I didn't fully anticipate this at the time, but the effect of never knowing anything about where I was and not having a list of exciting sights to look forward to was that I was forced to take in and appreciate my immediate surroundings to the fullest. I couldn't just count down the miles to the next cool place someone had told me about, because I didn't know about any cool places down the road. All I had to look forward to was my immediate surroundings at each step, and this placed a new importance on being present in each moment, and not taking for granted the small wonders around me. Where I was was all I had, if you will. This was a new type of travel for me. What I'd done in the past, and what I think most people do, is pick somewhere I want to go, buy a guidebook or talk to someone who lives there or knows the area well, and find out what I'm supposed to see when I go there. And this makes a lot of sense — you don't want to miss something incredible just because you didn't know it was there. But I think there's a danger in this, too: when we turn over responsibility for what we see to someone else, we often adopt a kind of follow-the-leader mentality, assuming that what they're showing us is all that's worth seeing, and we become blind to what exists in between the big, exciting sights. But when we go somewhere without a guide and have to learn about it for ourselves, we become much more engaged with our surroundings, and the sense of discovery that comes with that can be really exhilarating. When you're out there exploring the world on your own terms, you don't have prior expectations coloring your experiences. You're able to see things for what they are without getting caught up in what you thought they would be. You can appreciate the beauty of the subtle, everyday things that seem like a waste of time to someone with that guidebook mentality. If you think about it, when someone comes back from vacation and you ask them how it was, they often say something like, "Oh, we loved it there. It was really beautiful. But you won't believe what happened when..." The best travel stories, and the best memories, are often the stories of the unexpected. Some local character you met, something that went wrong that you had to figure out how to deal with — these are the unique experiences that give us a sense of intimacy with a place, that make us feel a real connection to a place. And you don't get this feeling by going to the same tourist attraction that a million other people have already seen. I'm not suggesting that those tourists attractions aren't worth seeing — they're often quite spectacular — but there's another dimension to travel that's really important, and that's the experiences you have when you're discovering something new and unexpected, and you're doing it on your own terms. That's the kind of thing that makes you feel like you're part of a place — that you belong there — and not just a momentary visitor. And, of course, the fact that I was walking instead of driving made it much easier for me to see my surroundings for what they were. When you travel by car, you're so isolated from the world, trapped inside that bubble of metal and glass. You can see what's around you to some extent (although in much less detail than when you're moving along on foot at three miles per hour), but that's about it. Walking, on the other hand, totally immerses you in your environment. For better or worse, it really fixes you in the moment — the sights, the sounds, the smells, and the weather become integral parts of your mood and your state of mind. You can't hide behind your expectations when you're walking; the reality of your surroundings encompasses you and forces you to acknowledge it. It's the same principle expressed in the story above about the West Bank wall: the less isolated you are from something, the easier it is for you to cast off your preconceptions about it and see its true nature. Once I began to realize how much I had been learning and seeing as a result of following my arbitrary route, I became quite stubborn about ever changing it. People I met would often tell me that I needed to go check out this or that, but I generally ignored their advice, because I didn't want to be in a situation where I was thinking about something down the road in lieu of what was right around me. I decided that it was my duty to experience my route to the fullest, rather than try to change it every time something more exciting came along. 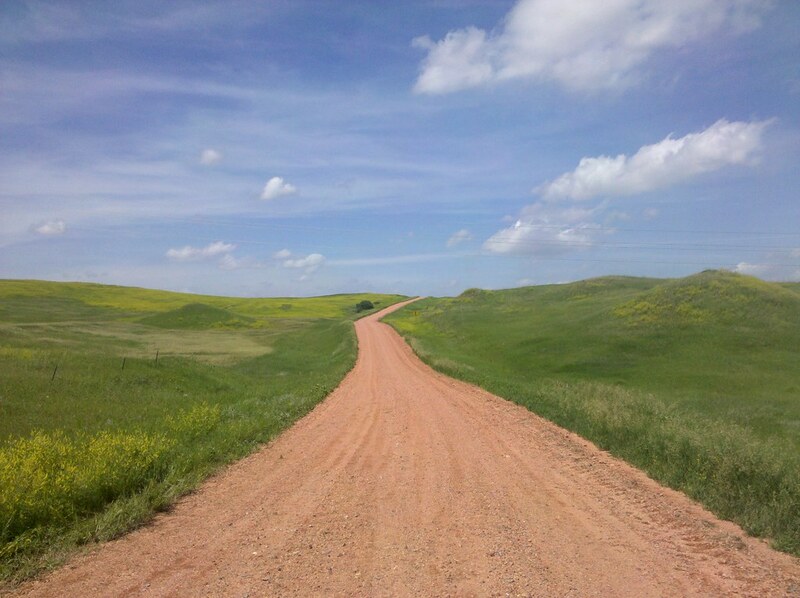 I mentioned above that I modified my route because I specifically wanted to walk across North Dakota. You may be wondering why someone would want to do such a thing; if so, the answer isn't going to shed a lot of light on the matter: I wanted to walk across North Dakota because it seemed to me like the most stereotypically boring state. I figured that either it would turn out to be more exciting than the popular image of it, which would help prove that you can't know a place without exploring it yourself, or it would be just as boring as advertised, in which case my ability to appreciate the little things would be put to a serious test. My experience there, of course, showed it to be a little of both. So for all my pretentious talk about shedding expectations and appreciating things for what they are, what the hell did I actually see on my walk? What did I get excited about? How did these things differ from what someone driving through in a car would have seen? How did they differ from what someone following a guidebook would have seen? What is there to see here? Not a lot, really. It's just a road and some grass. And there's certainly nothing to do here. But what a perfect moment it was when I looked up and saw this beautiful combination of colors and textures, out on the most quiet road you can imagine. Or what about this place? Maybe you can start to imagine what it was like to stand at the edge of this ocean of flowers, to feel myself immersed in its almost surreal yellowness. It was an unforgettable moment. But that's also all it was: a moment. It's not the kind of thing you can tell someone else to go see, and it's certainly not something that could be included in a guidebook. Can you imagine someone saying to you: "Oh yeah, there's this great field on the highway outside of Taylor. Just fly into Bismarck sometime in late June, rent a car, and drive west about 100 miles. Then stand there until the weather, and the sunlight, and your mood, and the bird songs are just right. You'll thank me." You can't recapture moments like these. They just happen, and it's only if you're in the right spot and actually tuned into the present that you're able to experience them. And it's not being in the right spot that is difficult, because there are an awful lot of right spots in this world. The hard thing is being present in the moment, but it's a lot easier when you're out there in the middle of a place on foot, feeling its calm or its warmth or its harshness in your bones, your senses filled up with its light and sound and smell. 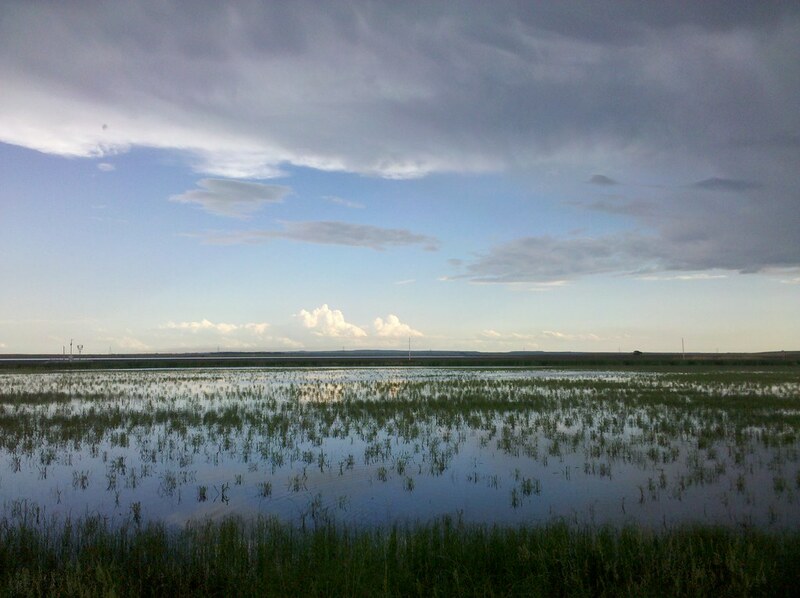 This is just some swamp a little east of Bismarck — not the kind of thing I or most people would consider particularly beautiful. But I happened to walk past it in the early evening, just after a storm had passed through, and it was such a placid, peaceful, reflective place under those conditions. 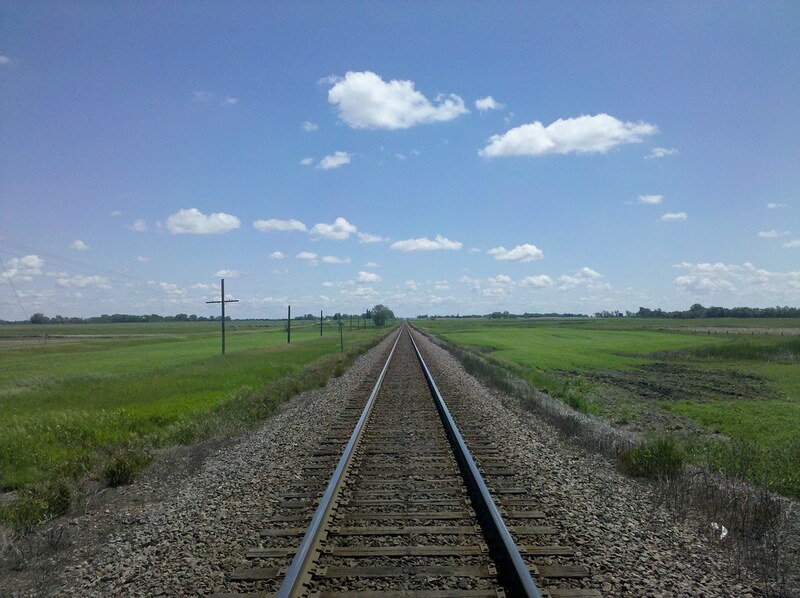 An endless railroad track running across the pancake-flat prairie. Sounds exciting! But it's also a place of exquisite geometry, when you take the time to stop and study it. 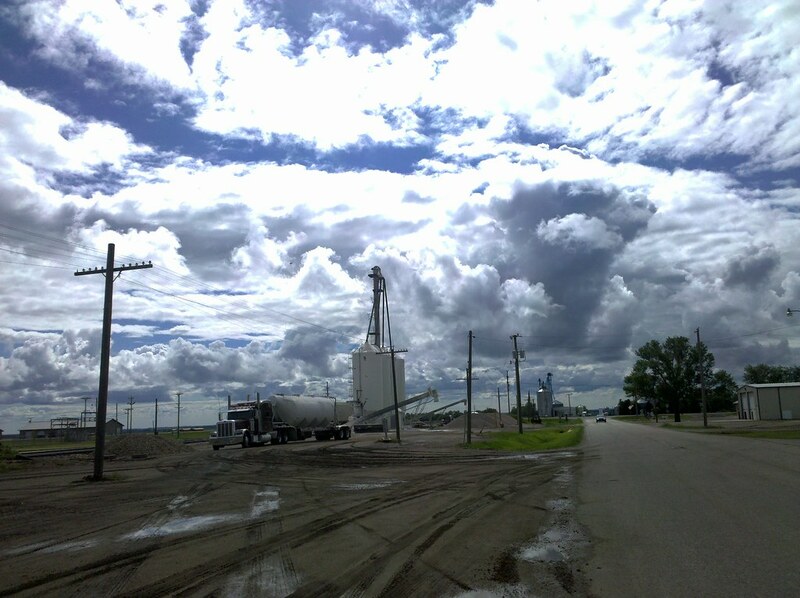 This was one of the less attractive parts of North Dakota, or anywhere, for that matter. But look at that sky — it's unreal! I wonder how many people out on the road that day, heading to work or to the store, were able to appreciate it. But it's not just the immersive, panoramic moments that you can better experience and appreciate on foot; it's also the smaller details that you might not notice traveling in a car. My blog is chock full of photos of these kinds of things, from mailboxes to flowers to beer cans to manhole covers. You can view a sample of them here, if you'd like, or you can just take a walk back through my photos to get a sense of how attuned to your surroundings you can be when you're out on foot, fully engaged in your discovery of the world. Many of my photos may seem to be silly and inconsequential, but all of those things were exciting to me at the time — each one was a unique, personal connection I was making with a particular place — and I was excited about getting to share them with others. Taken as a whole, I think they show how intimately you can get to know a place when you take the time and effort to explore it on your own terms, in your own way, free of the standard expectations of travel, and open to the things you might normally take for granted. Perhaps the traveler's most important challenge and highest calling is not to visit all the places worth seeing, but rather to find something worth seeing wherever he is. P.S. Another walking adventure is in the works! I hope to have more details to share in a few months. 1 For the record, I also was not mauled by any animals. I didn't see a single bear, mountain lion, or wolf, although I may have spotted a baby rattlesnake once. I was not attacked by any unleashed dogs, and I quickly learned how to use my body language — and a toilet plunger handle I happened to be carrying — to intimidate them when necessary. Probably the closest I came to a dangerous predator was at this grocery store in Montana. It was either that or these vicious dung beetles in North Dakota. As for severe weather, I did have a branch fall on my cart once during a storm, and it bent the handlebar a bit. But there were no lightning strikes, tornadoes, or anything like that. And despite this idea we have that the road is overrun with crazy teenagers texting away on their phones and not paying a bit of attention to their driving, I was not hit by any of the hundreds of thousands of vehicles that passed me on my trip. A couple made me a little nervous with their driving, but that was the worst that happened. Great perspective. Beautiful pictures. Welcome back to your blog! Thank you for stopping in on your 1 year anniversary as you did your “Walk on By”. You did SEAL the deal for me and I think everyone else today. I will read the full text tomorrow, but have already enjoyed parts of it and the beautiful tranquil photos. 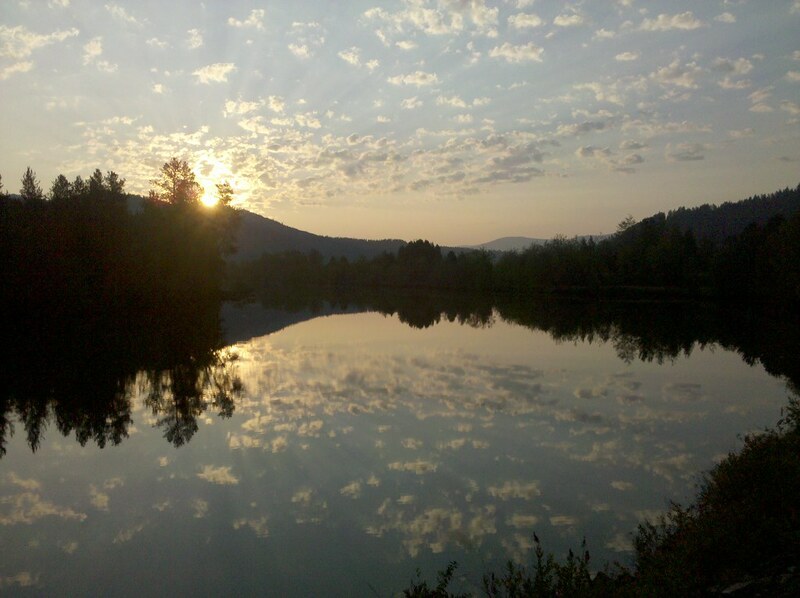 LOVE your blog and your pictures… Love the walk and the journey! I was updating my bookmarked websites tonight, when I saw “I’m Just Walkin'” on the list I clicked on it just to see if you had posted anything since your last post. What great fortune I have becaue you had only posted a couple hours before. I enjoyed reading your thoughts and you definitely got me thinking. Thanks for sharing. Thanks for coming back and sharing your thoughts with us. I loved following your blog last year. What a special surprise to see it updated in my blog reader today. I’m glad I never removed it! I hope to hear more about your next adventure. Ooooohhhh!! A new walking adventure! I can’t wait to find out what it is! Thanks Matt for sharing your observations with us. I will have to go back and keep reading more but one thought that came to me while reading the first several paragraphs was this: City life vs. Country life. I’ll leave it at that as I’m sure people will understand it. Thanks for the great time and looking forward to the next big adventure! It was great to read this– really nice piece. I had such a blast reading your blog last year and it was terrific to hear an update. What you’ve done is inspiring. I knew there was a good reason to keep this blog in my RSS reader. This is an absolutely wonderful and insightful and reflective essay, Matt. Thank you so much for sharing this and your entire journey with us!!!! My favorite part of this beautiful, insightful anniversary special: “When we let fear take control of our decision-making, we introduce a new and very real type of danger into our lives: the danger of not experiencing much of what the world has to offer us. Human existence is a pretty extraordinary thing, and it’s all too easy to let the remarkable opportunities it provides pass us by and leave us in the dust.” Thank you for the reminder to not be led by our fear, but instead to walk through them and in spite of them. Can’t wait to hear about your next journey, Matt. Good to hear from you again. Thanks Don for letting me know. I can’t wait until your next adventure. This summer my daughter/family and I drove thru Ohio–visiting places we had lived or been before.While it’s great to have GPS we decided to turn it off and get out the map and drive using it–the old -fashioned way. What a experience. Tryed to stay off the interstate. Newark Ohio –Longaberger Baskets office building is shaped like a basket!!! Matt, thank you so much for writing this recap. I’ve been thinking about you and your trip a lot in the last year. I have to ask a question which you may or may not be able to answer: Would you have been in danger if you were a female? It might be difficult to imagine as a man but most women live with a fear of being attacked that I think most men don’t. Your recap makes me wonder if that is due to the media portrayal of the ‘dangers’ of our society or based in fact. It’s given me something to think about. I have lead (and am leading) an adventurous life, but this ‘fear’ has held me back from doing many things I’ve wanted to. Anyway, thanks for everything, really, you’ve touched and inspired people. Not many people can say they’ve done that in their life. Sorry Matt to use your post for this, now I’ll send you one! I didn’t finish reading all you wrote… will save it for this weekend when I can give it the time and attention it’s due. Thanks again for reconnecting. I hope your future adventures take us to new places to meet new, friendly folks that clearly show us that personal journeys remain one of the most eye-opening educations that a person can experience. Uh one more thing, Happy 1st Anniversary from all of your inspired followers at Hobo Nation. Hey Matt, I found your photoblog thru my sister. She said your a good friend of her son Clarke. I like to do a bit of bicycle touring, so naturally I was intrigued with your travel. I’ll never get to do anything as cool as this, but I sure like reading and seeing your travels. I like the whole way you did your trip. Your visual observations on such everyday things with your funny comments are wonderful. If you aren’t already, you would be a good creative person in advertising. I also enjoyed your summary of your trip. I guess all that time on the road left plenty of time for thinking, and you did a good job. Thanks for sharing this. I hope to read of your future travels. Hey Matt I guess you have read where we went up to Michigan’s upper part and went all the way to Everett, Washington, then down thru Oregon, Utah, Wyoming, Colorado, Kansas, Missouri, Illionis, Kentucky, Tennessee, then Home to Alabama. That was during 4th of July. 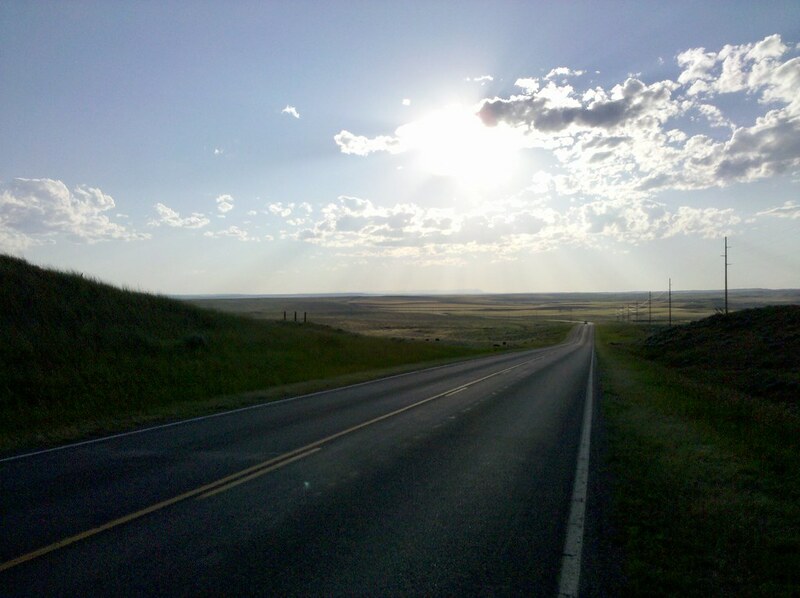 Around 4th of August we got back on the cycles and went to Sturgis, South Dakota for another 11 day trip. I would like to say that I was so intriged with your trip I got to wanting to see the country you had seen, and we loaded up and just done it. This is something every one should do at least once in a lifetime no matter how they di it just get out and do it. Well gotta go thought would let you know that we all enjoyed our part of the great northwester United States. This is the best thing I’ve read all year. Period. It’s so good to hear your thoughts again. As usual, your words of wisdom really inspire a lot of reflecting on my part, which is a good thing. I also want to thank you for bringing the Hobo Nation together. As I’m sure you know, there are several of us “regulars” who check in and post every few days. Many of us have exchanged emails and phone numbers, and have a good friendship. We are people who have never met in person, yet have “met” and gotten close thanks to you and your journey. There are some wonderful people in the Hobo Nation. I love the quote “The world is like a mirror; if you smile at it, it smiles at you.” That is so true. Thanks for sharing more thoughts with us. I can’t wait for your next journey!! Wow, you just made me cry with that! What profound thoughts. I’m crying because I feel so sad that we’ve lost faith in each other so much, and crying because you found people who havent. And I cant help wondering that if all the politicians had to sit down with each others and discuss things like human beings. You are a real inspiration to me. I keep telling people the world isnt as bad as they think it is, just bad things get publicized more. I hope you get a book deal so you can share your story with more people. Ahhh…a hint of the book to come. I’ll buy it. !! Never say never…..thanks matt. Nice to see all the comments above. Will right more later….just got a email from the Mayor to check up on the site….glad I did. Matt…awesome, awesome, awesome. Thanks for the time, inspiration and letting us all tag along. You started something unique .. and honestly…no one has even come close to the Bar and perspective you put into this. Peace and know you have many friends…not just those you met along the way. You have my vote for president..cause you can bring the masses together. Now..I know I am not first…and I won’t be last….so I am going back to re-read this slice of pie with my morning coffee. Love to you all!!! Jeff in Joisy…while down the Joisy sure. You’ve been on my mind these last few weeks…thinking back to a year ago and all of your adventures….how wonderful to see this post from you. As always, you give me lots to think about as I plan my trip to Europe. I’ve done exactly what the typical traveler has done…research the place…get the guide book and plan all of the places I want to see. Thankfully, the places I’d like to see are not the typical tourist places…so I get to appreciate things on a different scale. Now, I think I will take some of my time there just to immerse myself in the culture and not plan…just do. I look forward to your next adventure and the possibility of a book! I’ll definitely buy it too! Hello Hobo Nation!!! I’ve missed all of you!! Hay, I almost missed it….Another walking adventure in the works….woo hoo…. Just got done reading the above. Matt ..thank you for your observations. As a traveler I read alot of reviews..of places and people….and many times…you read that the people are mean and not friendly..at places…. but what you say above, I find to be true…..Kindness begets Kindness, A hello and a smile gets you back the same. Peace brother…your pictures are wonderful and I will never get tired of looking at america through your eyes. Back in 93 my brother and I spent 2 months on a road trip starting and ending in Vancouver and travelling through British Columbia, Alberta, Saskatchewan, Montana, Wyoming, South Dakota, Nebraska, Colorado, Utah, Nevada, California, Oregon & Washington. By and large we avoided the big cities and interstates, prefering to drive the smaller roads and towns. (Fortunately the rental company had no idea of the amount of dirt roads we drove on thanks to an extended car wash on the last day). The one thing that struck me was the friendliness and helpfulness of ordinary Americans and Canadians to a couple of Aussie guys. Combined with the amazing landscapes we passed through it added up to the most amazing two months of my life. Your blog brought back so many memories of that trip and your photos could have been peeled from my album. I remember taking a shot of the Madison range in Montana with ominous thunderheads building and casting an eerie purple glow over the entire scene and a shot of the endless Canadian prairie that was virtually identical to one of yours. Finally, to show you that although the world is a massive place (as you and your feet would know) it is also smaller than you think. A few years ago my wife and I took a trip through Victoria and New South Wales. Late one afternoon as we crested a hill on a little dirt country road we saw the most amazing field of Canola. 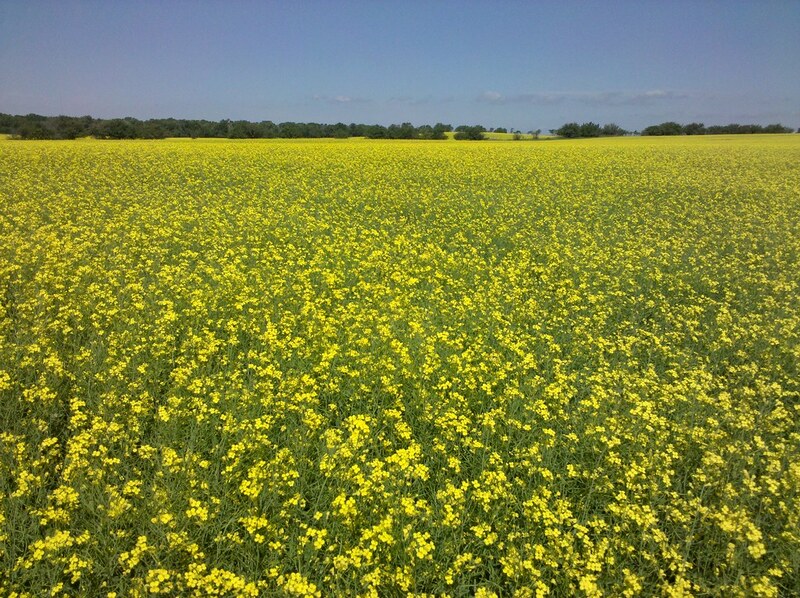 The yellow flowers were in full bloom and the vibrant carpet seemed to spread to the horizon. Of course it demanded a photo and several minutes to drink the scene in. The resulting photo (if not for the gum trees in the foreground) could have been taken by you. To think, although spanned by the breadth of the pacific ocean and by several years in time, we probably each had the same kind of moment and experienced the same feelings in the simple beauty of a field of flowering canola. Keep up the good work Matt. You are an inspiration and I look forward to your next adventure. way and bringing bikes and touring your countryside in approximately 2 years after we finish covering rest of U S states on cycles. You got to love Canada though, hope your outback is as great as of of Canada is. I hope everyone’s having a good weekend. Just wanted to check in and say hi. I’m doing okay. I say we continue our conversations where we’ve been at. I don’t think we should cloud this one up with new talk. Lets keep it to the previous page. Thanks. (my opinion). Beautiful recap of capturing the moment. I’ve seen those yellow fields and thought the same thing- I wish everyone could have this experience but who would want to travel to ND. I didn’t want to but glad I did. Pictures are awsome. Also, traveling cross country on a motorcycle might be the closest (other than a bicycle) because you get to feel all the weather which reminds you of the awsomeness of earth. It’s very spiritual. I happened to come back here when looking at favorites on our computer. I’m glad I did!!! I enjoyed reading your thoughts! I’m looking forward to your next trip. Great read Matt – thanks. Just stopping by to read your latest post. I monitored your progress everyday after reading your story on yahoo. Absolutely amazing and inpirational Matt. Thank you for sharing. Hi! Nate Damm told me to check you out, and boy, I’m glad I did. If found much of your conclusions and experiences to be spot on and it matches my own limited experience walking across America. I started at Heceta Head Beach and walked as far as Santiam Pass in Oregon, then rode my bike to Boise, Idaho. I didn’t get to finish my trip, but the kindness from the people I met was incredible. Kudos to you for finishing! And kudos for pointing out the overlooked obvious–Americans are some pretty cool people, overall. Our country is beautiful and should be explored. You’re right. Those little things–we see them better on foot. We stop to smell the roses, so to speak. I have tons of pictures from my trip, and they are among the most treasured possessions I own. Just read your tale today. I followed you on your journey, and looked forward to it each day. Have you thought about publishing a book, with photos included? I’m sure all of us who have followed you would rush right out and buy it, and then share with our friends. Good luck with planning your next journey. I compliment you on doing what your heart desires. Keep up the good work. Matt – thanks for coming back with that summary view one year on. You have the wisdom of the trip that you have kindly bestowed upon us all. Well done. I thouroughly enjoyed your recap and mostly your new perspectives, so thanks and keep up the good walk! Completely enjoyed reading your blog as you made your way across the country. It added life and a sense of adventure to my othewise uneventful days in my cube. Enjoyed reading your summary also…lots of good thoughts. Although I can’t imagine you’d do the same route again, if you’re ever walking through minneapolis again, there is a guest bedroom, dinner, and beers waiting for you. Matt, It was great to hear your new perspective on your walk. I hope this year brings you even more insights and fulfills your hopes and expectations. Welcome back, Matt! I have missed you. I look forward to your our next adventure!! This all sounds so exciting Matt! Getting your email this morning made me smile. I’m from MN and have made the drive through the Dakotas, Montana, and Wyoming (ending up in Portland) several times now. I’d be hard pressed to name a more beautiful stretch of this country. I actually made the drive from Portland to MN while you were walking through Western Montana – I was hoping I might be able to find you on the way. Thanks for the perspective and for sharing your really incredible journey. While you were walking your thoughts and photos were part of my life every day. I look forward to more. WOW…made my midday, “hearing” from your adventures yet again and even moreso. The particular stories, people, viewpoint….LOVE! Thank you for keepin on. I have forwarded your amazing journey to tons of people. Your journey continues to grow and inspire. Thank you Matt! Good luck in your new adventure Matt! I love reading your updates and viewing your pictures when I’m eating lunch and gazing out my office window, although I do heave a mighty sigh once in a while! This is the most inspiring travel-writing piece I have ever read. 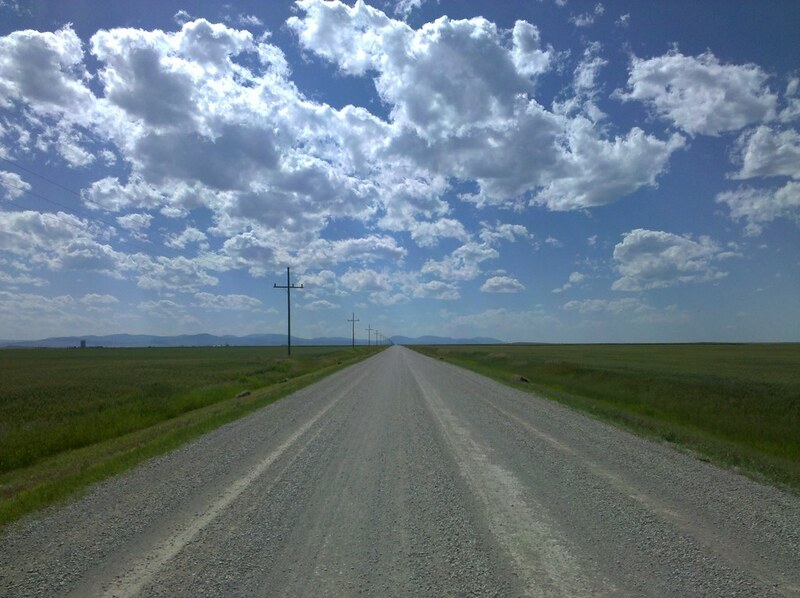 I rode my bicycle through North Dakota – which I used to consider ‘slow travel’ until I read your blog – and was also surprised by the stunning, unguided, unexpected moments. Embracing travel, to me, means being open to experience these subtleties – and you have illuminated the rewards stunningly with your photos! I also learned from your comment about sticking with your route. I tend to be an ADD traveler, getting excited and overwhelmed by recommendations and new possibilities. Now I see how sticking with your route can really force you to change your mindset, to look for the beauty in unexpected places – which means you don’t have reach for fulfillment externally, it’s waiting right here for you to see it! You’re going to be the grandpa with the most interesting stories one day. Hey Matt. I first saw your story on the news about walking across the country and have visited your blog a few times. Glad you posted a new update with reflections. I was really inspired by your walk, and I think it was what a lot of us “cubicle Americans” dream of doing. I became so inspired in April of 2011 I started walking around my town with my wife, usually on 4 to 9 mile walks 4 to 5 times a week. It’s been a lot tougher in the cold winter here, but I have a treadmill in my basement and still try to log in 15 miles a week on it. I’ve been amazed at the almost feeling of relaxed uphoria after completing the walks. The health benefits seem amazing and at the present time I feel like I could live to 100. I also lost about 35 pounds. Good luck on your new NYC walking adventure! What beautiful words of wisdom. I use to bike to work which was about a 30 minute bike ride, and I had several people tell me how dangerous it was. It was daylight, a safe neighborhood, with sidewalks and a bike lane!! HAHA you’re right about the fear thing for sure. Those moments even biking to work were so peaceful and I got to see so much of life, and clear my head at the same time! You sir, are a very special person! Just subscribed to your NYC updates. Keep on walkin’ ! Just read this “summing-up,” was surprised to see how heavy North Dakota figured in your travels. I’ve lived in North Dakota pretty much all my life and although it can be desolate in the winter – it can be breathtaking in the summer. I saw you walking beside the road in La Crosse, Wisconsin, where I was living and working at the time. I’ve just spent the better part of a morning reading and looking at your updates when you traveled through NoDak where I now live again. The state is changing in a major way with the oil-boom though. I fear a lot of the unpopulated, rural beauty may fast be disappearing. Will try to follow you a bit more closely now that you’re walking all over NYC. You’re certainly an inspiring fellow, keep up the good work. Thanks to the NY Times for making me aware of you and your walk around the city. I am walking with you vicariously, as I’ve ruptured my Achilles tendon and am in an un-walkable hard cast for six weeks as it heals. As Joni Mitchell sang in “Big Yellow Taxi”: Don’t it always seem to go, you don’t know what you’ve got till it’s gone. That’s how it is with walking. I hope to never take it for granted again for a single step. Having lived in NYC back in the Eighties, and revisited it often on business, you’ve inspired me to walk more of that wonderful city when my Achilles heel heals. The wisdom you gained on your walk across the continent is deeply moving, spiritual, and quintessentially American. Thank you for writing so beautifully about it. “One nation indivisible” is something we’ve forgotten, I fear. Rereading your Thoughts on the Red Line: The Extended Edition, and this quote comes to mind .. Thanks so much for sharing this. It was absolutely riveting. I’m slowly going back through your archives and reading more about this cross-country adventure. It is something I’ve been wanting to do for years. I am writing to ask if I can use your photo of the railway tracks in a powerpoint I’m making on grain elevators. It is for a community development workshop this weekend and I will add your web site inmustwalkin.com as the credit. Or if you like I can add your name if you send it. really well written, amazing insights. 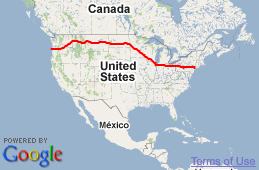 I hope to walk across the states some day, I’ll be starting in the UK fairly soon. unless I get sacked, then I’ll be starting sooner. Grateful for you sharing some of your reflections from this monumental trip.